Vera Cooper (1928-2016) was born in Philadelphia. Her parents were Jewish immigrants from Eastern Europe (who changed their last name from Kobchefski to Cooper). From the young age of just 10, Cooper was interested in astronomy, and was later the only woman studying the subject in her college. She intended to continue graduate studies at Princeton but was forbidden because of her gender. Cooper went to Cornell University instead and studied astrophysics and quantum physics. There she also met her husband, Robert Rubin, who was pursuing graduate studies in chemistry. The two had four children, all of whom became Ph.D scientists and mathematicians. Rubin completed her Master’s in 1951 and went to Georgetown University for her doctorate. Around this time, she discovered that whole galaxies are rotating around their centres – an idea so revolutionary that it was initially rejected. Her 1954 Ph.D thesis was similarly revolutionary, showing that galaxies must be clumped in clusters. No one paid attention to this work for another two decades, when it was confirmed to be true. In 1965, Rubin was the first woman allowed to use Caltech’s famous Palomar Observatory. She then became a Senior Fellow at Washington’s Carnegie Institution, where her research was focused on “galactic and extragalactic dynamics”, among other things. Rubin made critical calculations with regards to galactic rotation rates, and together with her friend Robert Ford, discovered what is now known as the Rubin-Ford effect. In her studies, she found that galaxies are spinning so fast that they should be flying apart. They do not fly apart because gravity keeps them together. But, there is not enough visible matter in galaxies to generate so much gravity! This led Rubin to confirm the existence of invisible dark matter. This was perhaps her biggest breakthrough, and completely transformed astrophysics. 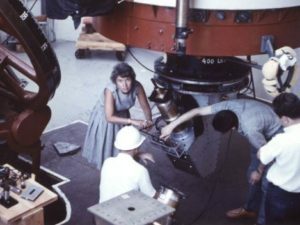 For her tremendous achievements, Rubin has won multiple awards, including the National Medal of Science and the Royal Astronomical Society’s prestigious Gold Medal. There is also an asteroid named after her. Sadly, Rubin passed away earlier this week. 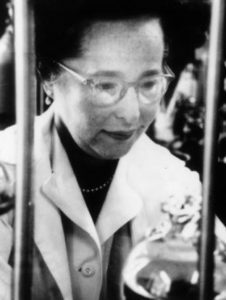 Despite being 88 years old, Rubin continued her scientific research (focusing on the motion of distant stars) until the last days of her life. She was a pioneer for women in science, and worked tirelessly to get more women elected to the National Academy of Sciences. Rubin was proud of her Jewish heritage, and often spoke of the beauty and value of science and religion when studied together. In addition to half a dozen important scientific publications, Rubin wrote a book, and was featured in two documentaries. She was once described as an American “national treasure”. This entry was posted in Science & Technology and tagged American Jews, Astronomy, Astrophysics, Caltech, Cornell, Dark Matter, Georgetown, National Academy of Sciences, National Medal of Science, PhD, Philadelphia, Physics, Princeton, Quantum Physics, Royal Astronomical Society, Rubin-Ford Effect on December 27, 2016 by Jew of the Week.